Emergency exit lights are fixtures in most modern buildings. They are familiar enough that we may take them for granted despite their essential role. What may be less familiar to some is the fact that these lights must undergo regular inspections. Building managers should be aware of the fact that these lights are installed to make fast egress possible in emergencies. How well they function can literally make the difference between life and death for a building's occupants. If you manage a building, you should understand the laws that govern emergency and exit light inspections. The placement of emergency and exit lighting. The NFPA's rules specify the location of signs and how floors should be illuminated. No point in an exit access area should be beyond 100 feet or the sign's rated viewing distance, whichever distance is less. The amount of emergency illumination. Emergency lighting should not be less than one lumen per square foot. At no point should maximum illumination at any one point exceed 40 times the minimum illumination. The point of this is to prevent overly bright and overly dark areas. How long emergency lights should last in an emergency. The NFPA states that emergency illumination should not last for less than 1.5 hours on full battery power in the event that normal lighting fails. The schedule for inspecting emergency and exit lighting. You should inspect emergency and exit lights every month. The NFPA's code also specifies that the monthly functionality tests of emergency and exit lights should last for 30 seconds. They also advise that building managers keep written records of monthly inspections. These records are important since the local authority having jurisdiction may require them. No more than five weeks should pass between monthly inspections. Along with the 30-second tests, building owners and managers should test emergency and exit lights once per year for 1.5 hours. 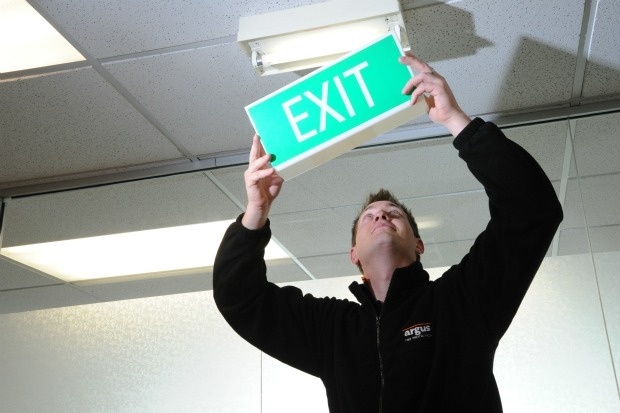 What Happens If You Neglect Inspections of Emergency and Exit Lighting? It is common to find property managers and building owners who are aware that testing their emergency lighting is mandatory. Legally speaking, they do not have the option of not testing. The penalty for lapsed testing of your emergency and exit lighting is — firstly — hefty fines. You may also face fines if the local authority having jurisdiction audits you and you have no records of tests. Even so, facing fines may actually be one of the better outcomes. Things can get much worse if an emergency situation occurs and the emergency and exit lighting fails. People attempting to exit the building may fall and injure themselves because the exit access areas are poorly illuminated. Keep in mind that in an emergency, anxiety can cause people to make mistakes that they would not otherwise make. If someone is badly injured because they could not exit the building quickly, then serious legal liability becomes a factor. When was the last time that you had your emergency and exit lights tested? If you are unsure of the answer or suspect that they may be due for maintenance, you may need to call in a professional. Lighting Services, Inc. would be happy to handle testing and maintenance for you. Our team has the knowledge and equipment to ensure that your emergency and exit lights are up to code. Contact us today to make an appointment and get a quote.